Epygi remains at the forefront of the telephony industry, due to our commitment to innovative R&D and product design. We are committed to improving the efficiency and productivity of your business through innovative products and feature capabilities. Epygi Technologies’ products provide economical options that do not compromise on quality. We believe that whether your company is made up of one or 2,000 people, we can provide you with a dependable PBX or Gateway. With such reasonable prices, it’s hard to believe the multitude of features that are available in one compact appliance, and the best part is, there are no hidden costs. 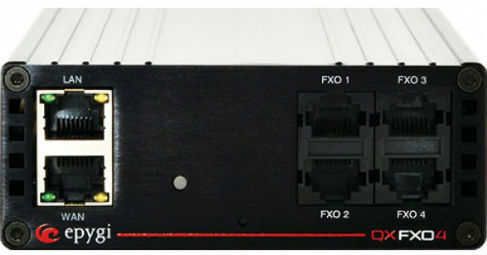 The new QX line consists of three IP PBXs and four Gateways. The QX products are more compact, fully rack-mountable and contained in a metal enclosure. The new products are meant to mix and match for a fully customizable system to fit every consumer’s specific needs. With the purchase of a rack-mounting kit, the units also come with two DC power cables for power redundancy. With built-in auto-configuration, firewall and secure VPN support, the QX Gateways are designed for a more user-friendly experience. Epygi’s QX Gateways are SIP-compliant, and can be utilized to include additional FXO, ISDN, FXS, T1 or E1 ports to any of Epygi’s or other manufacturer’s IP PBXs. Integrating an Epygi QX Gateway with any QX IP PBX allows for the Gateway to be managed through the IP PBX’s GUI.